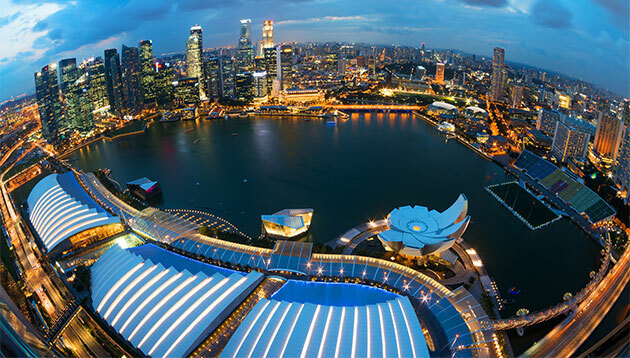 Singapore’s Ministry of Manpower (MOM) has accepted the recommendations of the Tripartite Cluster for Landscape (TCL) Industry report on 30 November 2018. 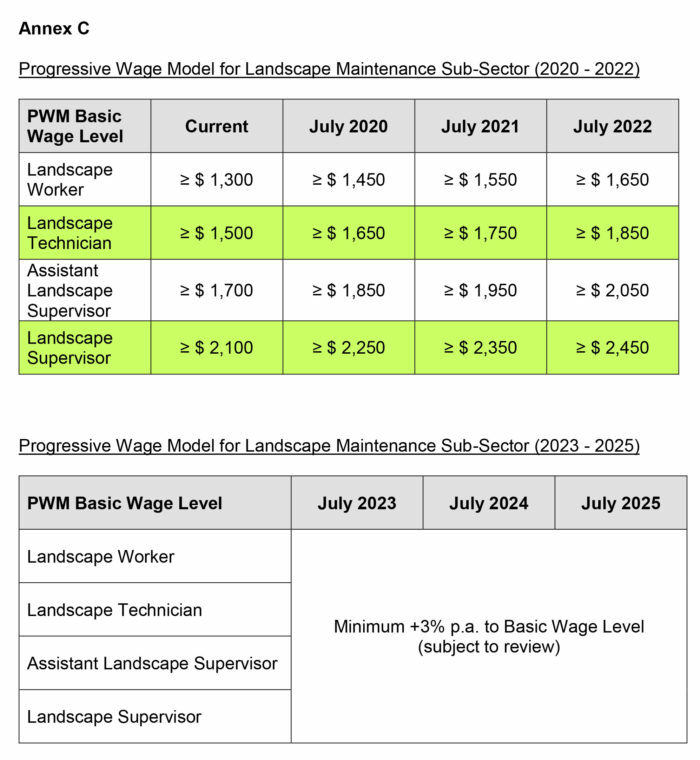 The recommendations include yearly adjustments, a schedule of increases to the Progressive Wage Model (PWM) basic wage levels from 2020 to 2025, as well as the introduction of a mandatory PWM Bonus for the landscape maintenance sub-sector from 2020. The TCL will release more details on this at a later date. 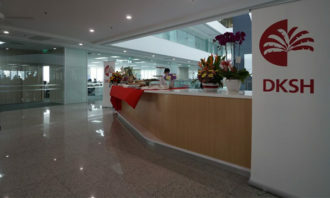 The TCL recommended a total increase of S$350 to the PWM basic wage levels across job roles, starting with a S$150 increase in July 2020, followed by a S$100 increase per year in July 2021 and 2022. 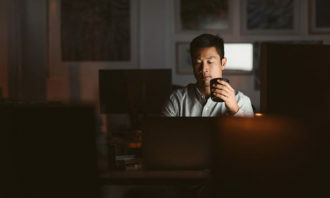 These adjustments will be effective 1 July 2020, in line with the schedule for the cleaning sector’s PWM schedule as well as to allow sufficient lead time for the incorporation of the wage adjustments in new service contracts. 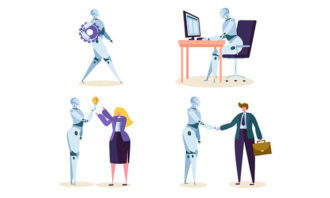 From July 2023 to July 2025, an annual increment of at least 3%, subject to review, will be scheduled for the PWM basic wage level across all PWM job roles. 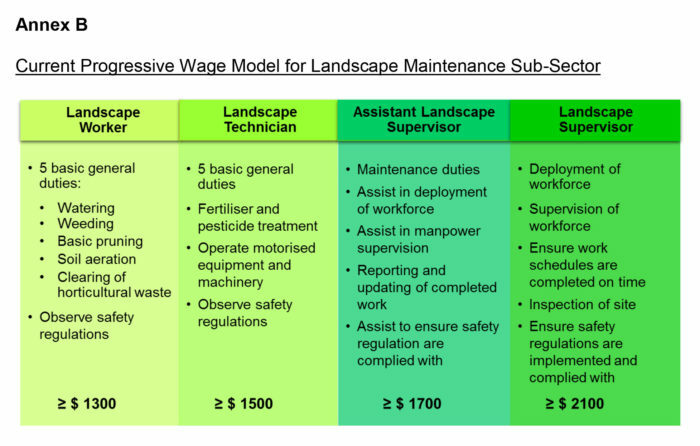 This will ensure sustainable wage increases for the sector over time, as well as provide greater clarity to landscape maintenance employees on how their wages may increase as they progress in their profession. The schedule will also be consistent with those of the cleaning and security sectors’ PWMs which were previously agreed on.